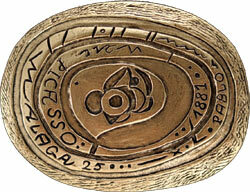 This unique pebble-shaped medal was struck in 1981 to celebrate the birth centenary of the Spanish artist Pablo Picasso. For this occasion, UNESCO organized several events in Paris: an international symposium, an exhibition, the publication of a book and an entire issue of The UNESCO Courier devoted to the artist. This celebration was decided upon by a General Conference resolution the previous year, taking into account the “great impact and universal significance of Picasso’s work in relation to the evolution and transformation of contemporary art.” The artist’s 76-square-metre mural, The Fall of Icarus, has adorned a wall of the conference hall foyer at UNESCO’s headquarters since its inauguration in 1958. The medal was designed by Joan Miró, Picasso’s friend and compatriot, then honorary president of the International Association of Art, who donated the medal’s original drawing to UNESCO. Still another Spanish artist, Joan Gardy Artigas, a friend of Miró’s, made the model from which the medal was struck. 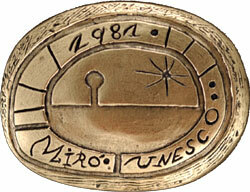 The obverse bears the inscription Pablo Picasso – Málaga – 25.X.1881 and is described by Miró as follows: “In the centre, an eye, like the eye of Picasso, deep-set and alert, surrounded by magical and musical inscriptions.” The reverse shows a landscape with a deserted field, a tree and a star on the horizon and Miró’s signature. UNESCO awards this medal to individuals or groups in recognition of an outstanding contribution to the arts or culture.